In 1867 Russia was in a difficult financial position and sold Alaska to the United States. Perhaps its time to consider selling it back. Russia might pay for this helped with their huge oil revenues. At 350 million acres, by offering to sell back Alaska to Russia at a mere $5,000 per acre, there would be an almost two trillion dollar infusion into our Treasury. This would pay for the bailout of Wall Street and hopefully restore our financial markets as well as pay the cost of the Iraq War. There is certainly precedence for this. Countries sell territory when they get into big problems. For example the 1803 Louisiana Purchase from Napoleon. 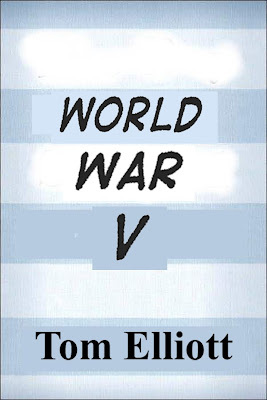 First time novelist Tom Elliott has hit a home run with this propitiously published new novel, “World War V”. Elliot seems to be a cross between Follett, Vonnegut, and Pynchon but with an uncanny ability to capture the disparate characters playing in the big picture of a world stage while simultaneously being so fallibly human. The year is 2010 and in the midst of a worldwide financial crisis, accelerating inflation, and tightening of credit, traditional military war is being replaced by economic war. OPEC, Venezuela, and Russia have been holding secret meetings, each with their own agendas but with the realization that together they can put enormous pressure on the west to advance their agendas. And together they are able to pressure China by both reassuring it on its energy supply and suggesting a way to bolster its relative geopolitical power and prestige. 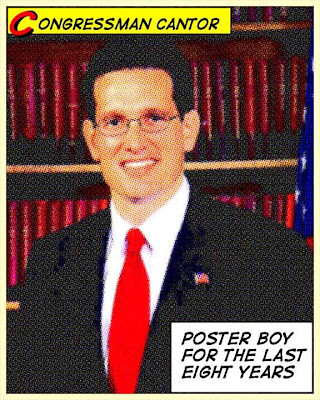 Why Is Congressman Eric Cantor Not The Prime Example Of The Type Of Politician That McCain And Palin Say They Are Fighting Against? Rather than go into a lengthy discussion on the ineptitude and toadiness of Virginia’s 7th District Republican Congressman, I thought this interview of Cantor by Chris Matthew would better prove my point. Will Virginia Decide The Election? Regardless of all the national polls, least we forget, it is the electoral votes that decide the presidency. 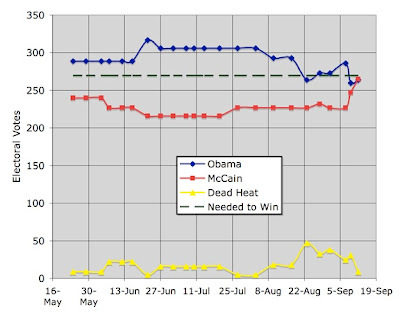 An interesting insight into this dynamic is provided by intrade.com, which uses the consensus of the market where real dollars are being bet on the presidential election and other political races. I’ve plotted the “market value” of the electoral votes and here is the graph. And it’s a very close race by any measure. And Virginia is both now in play as a swing state and perhaps is a presidential decider. Northern Virginia is swinging blue and has for years. And to some extent, so is the Richmond metropolitan area. Surprisingly, the stalwart conservatives in the Norfolk area are even giving Obama a second look. Certainly rural and western Virginia will vote along conservative lines. The Presidency Will Change – But What About The Congress? With both parties waking up to the clarion call of all Americans for change, and not just change, but basic change in the way our government serves its people, there are now four individuals of uncommon promise. The presidency will change. But perhaps much more importantly, will the Congress? Mohandas Gandhi is quoted as saying, “I like your Christ, I do not like your Christians. Your Christians are so unlike your Christ”. To follow in that thought I have to say to the McCain campaign, “I like your presidential candidate, I don’t like your Republicans. Your Republicans are so unlike your presidential candidate”. Behaviorists who study such things say that sarcasm is an indirect form of anger. If that is indeed true then the speeches at this year’s Republican convention, especially those of Romney, Giuliani, and the vice presidential candidate Sarah Palin dripped with that subsurface anger. But what are they angry about? Are they angry that the last eight years of Republican control has been so disastrous that they feel power slipping from their hands? Are they angry at a countrywide awakening that we are up to our collective asses in problems and its time for a change. Are they angry that regardless of who wins in November there is a mountain of debt that will have to be paid back by all of us – Democrats and Republicans. I’m at a loss for an answer. Do you know who your Congressman is? If you do, I challenge you to ask the next five people you meet and find one more who does. Perhaps it’s just that your Congressman is more a part of the political machine that only raises its head when elections roll around. And which provides the ride back into power of career politicians who see their main challenge as raising more money so they can continue to stay in power. In the midst of two weeks of political party conventions, the volleys go back and forth but one common theme is prevalent – and that is that the Congress has been ineffective in the last eight years in addressing the important problems facing our country. And there has been possibly no Congressman more associated with this gridlock, this inability to work across the aisle, this putting of party interest above the interests of America than Virginia’s 7th District Congressman Eric Cantor.